Seven years ago I published a set of projections suggesting that the emerging middle class in developing countries was about to surge (Kharas, 2010). I argued further that demand from this segment of the market could drive global economic growth and partly offset lower demand among middle-class consumers in developed countries who were struggling to deal with the shocks to their living standards caused by the Great Recession. Since then, four relevant developments have shaped middle-class calculations, and the first two of these turn out to have quantitatively important implications for overall estimates of trends and levels. First, a survey of purchasing power parity (PPP) prices, conducted in 2011, has replaced the previous 2005 PPP survey (World Bank, 2015) as the basis for comparing real income levels across countries. The 2011 survey differs not just in updating price levels, but also uses a new methodology for generating country-level data. The results have markedly changed and improved our understanding of countries’ and households’ relative economic strength. In brief, Asian and African countries were estimated to be far richer, compared to other countries, than previously imagined. These new data, especially on prices and growth, suggest that the global middle class, numbering about 3.2 billion in 2016, may be considerably larger, by about 500 million people, than previous calculations suggested. The second development has been the continued weakness in global economic growth. Global recovery has fallen short of forecasts and remains weaker than the recovery from previous recessions (although perhaps in line with the rate of recovery from previous financial crises). Major institutions have sequentially and continuously downgraded their growth forecasts. The hoped-for “green shoots” have not materialized. The third development is the continued improvement of GDP data. In some countries, there has been a rebasing of national accounts leading to significant revisions of estimated output and national income. Fourth, there have been several new household surveys that permit a more up-to-date assessment of income distribution at a time of significant changes in within-country inequality, and, in some cases, allow for direct measurement of the middle class for the first time. 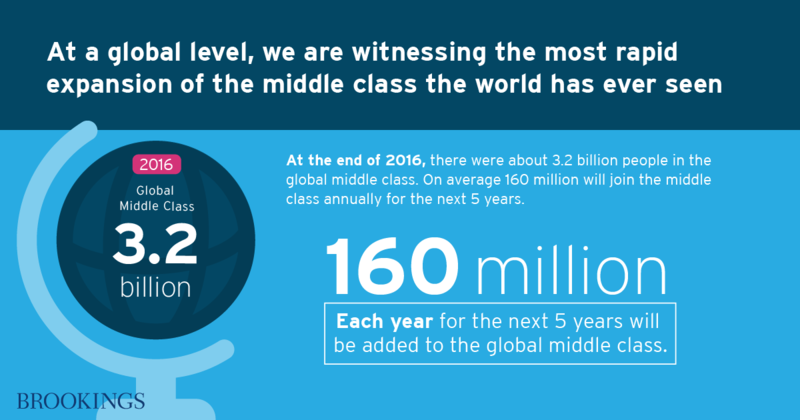 These new data, especially on prices and growth, suggest that the global middle class, numbering about 3.2 billion in 2016, may be considerably larger, by about 500 million people, than previous calculations suggested. Asian households, in particular, are now thought to be much richer, relatively speaking, than before. Notwithstanding gloomy forecasts for global growth, middle-class expansion seems set to continue. 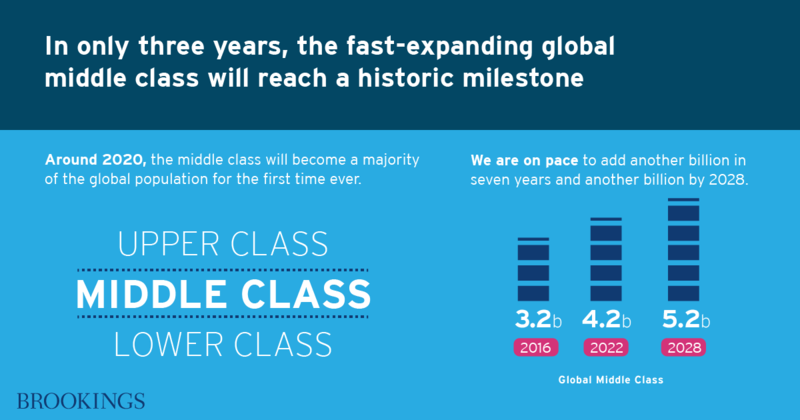 In fact, the next decade could see a faster expansion of the middle class than at any other time in history. Within a few years, based on current forecasts, a majority of the world’s population could have middle-class or rich lifestyles for the first time ever. The most dynamic segment of the global middle-class market is at the lower end of the scale, among new entrants with comparatively low per capita spending. 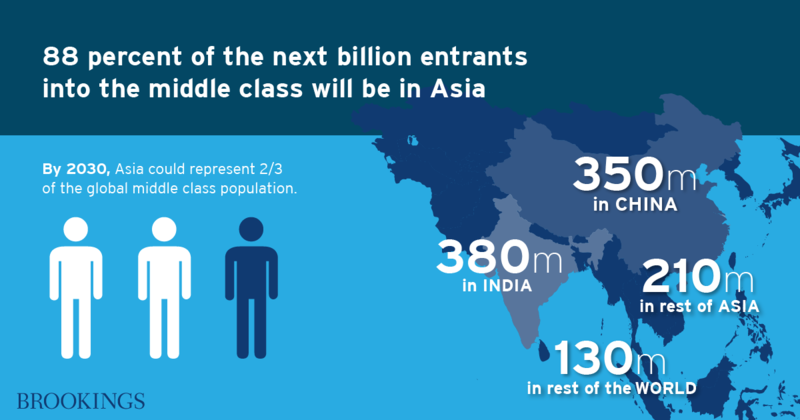 While global numbers are driven by developments in the largest economies in the world, notably China and India, the middle-class expansion is expected to be broadly based, but heavily concentrated in Asia. The vast majority (88 percent) of the next billion people in the middle class will be Asian. 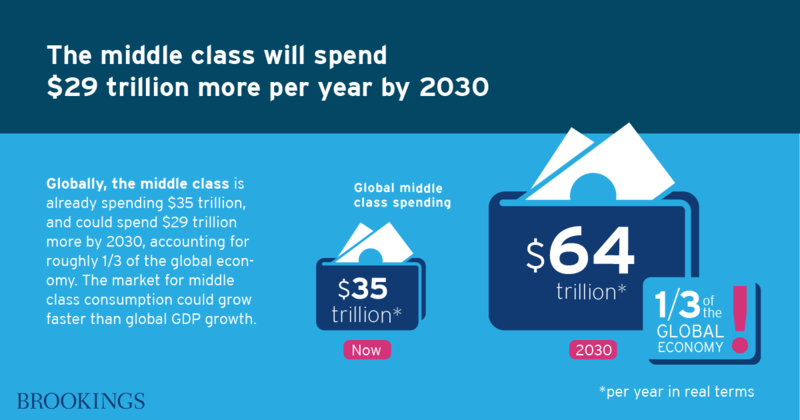 Globally, the middle class is already spending $35 trillion (2011 PPP) annually, and could be spending $29 trillion more by 2030, accounting for roughly a third of projected GDP growth (in PPP terms). The market for middle-class consumption could grow at an average rate of about 4 percent in the long-term. While this provides some impetus to the global econ­omy, it is not as large as the demand growth generated by middle-class spending in North America and Europe during the 1960s and 1970s, which exceeded 5 per­cent per year. The global average masks two distinct groups of roughly comparable size. 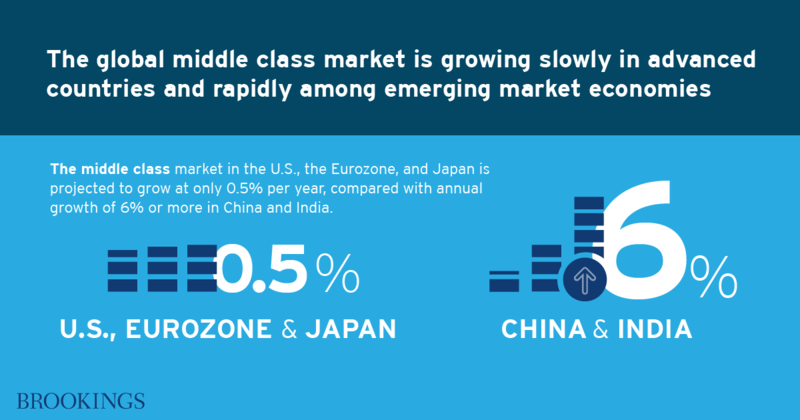 The middle-class market in advanced economies has matured and is projected to grow at only 0.5 to 1 percent per year, while the mid­dle-class market in emerging economies is far more dynamic and could register annual growth rates of 6 percent or more. The changing distribution of middle-class spending toward new entrants will have an effect on markets. Households just entering the middle class will seek to purchase consumer durables, as well as services including tourism, entertainment, health, education, and transport. Growing middle-class spending will undoubtedly have an effect on carbon emissions, but the size depends on government policies. 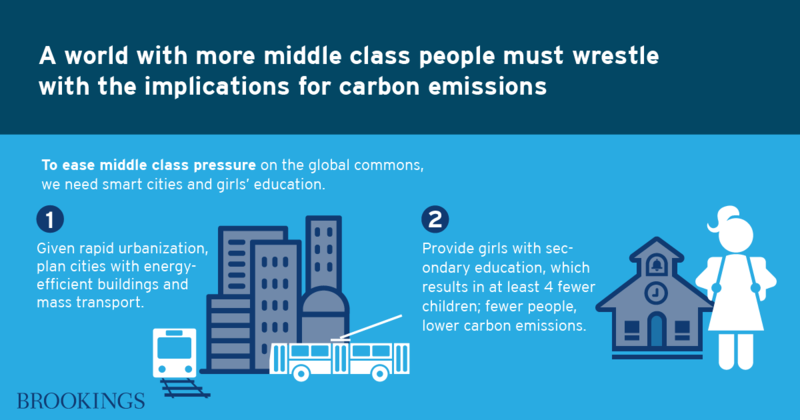 If cities are properly planned with energy-efficient buildings and mass transport, and if aggressive campaigns are introduced to provide uni­versal secondary education to girls, then the carbon footprint of global middle-class expansion can be re­duced considerably. Crafting political support for the middle class may present a greater challenge. Unless globalization can be reframed into a win-win for the middle class in each country, the political narrative can be distorted into one of colliding interests between the middle class in emerging economies and those in advanced econ­omies. A new package of “inclusive growth” must be constructed based on the common theme that con­tinued widening of income and opportunity inequality, and the barriers these create to social mobility, must be forcefully tackled while preserving the benefits af­forded by globalization and technological change and innovation. Throughout this paper, I use “developed countries” and “developing countries” alongside “advanced economies” and “emerging economies” to describe country groups. Though these terms have no exact definitions, they are in common use and so used here with no prejudice as to the level of development of any particular country. When referring to data sourced from the IMF, I use emerging economies as shorthand for “emerging and developing” economies.